Comfort food means different things to everyone, I get a little baffled when people ask me to name my favorite. For one, I have a favorite comfort food for each meal of the day, my choices also vary by season and my favorites will vary and if that isn't crazy enough, sometimes I want to pick my favorite comfort food by geography. But despite this overwhelming web of complexity that I create for myself, it would be easier for me to pick my favorite comfort ingredients. In that list, without a doubt I'd definitely include potatoes! 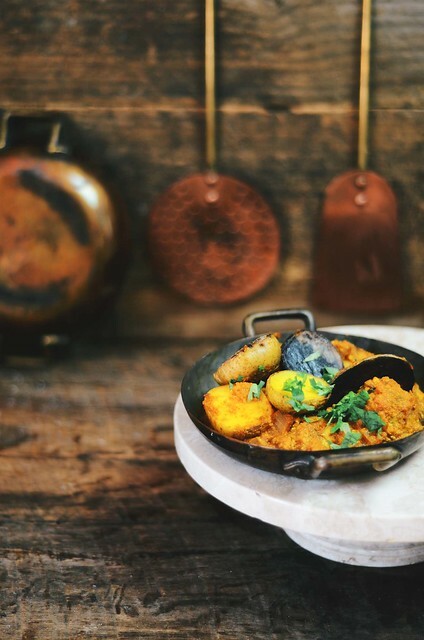 One of my favorite ways to prepare potatoes is in this spicy, tangy and creamy sauce that hails from the North of India known dum aloo. Dum is a cooking technique where vegetables or meats are allowed to cook in their own steam and the vapors of a small amount of fat. We ate this dish often as kids and I'm sure my father still makes this dish whenever possible, as this is one of his favorites. Traditionally, baby potatoes are deep-fried and then folded into a simmering pot of a rich cream and yogurt based sauce. This version is a little different, for one, I decided to brighten the colors a little by using a bag of mixed colored baby potatoes. Fingerlings would also work great here! I skipped the deep-frying part and instead decided to sear the potatoes in their jackets ,a little and cook them until they were lightly crisp and browned on each side. Instead of heavy cream, I scaled up the amount of plain yogurt and got a thicker and richer flavor using the Greek kind. You can use ghee (the more traditional choice) or olive oil here, it's up to you. 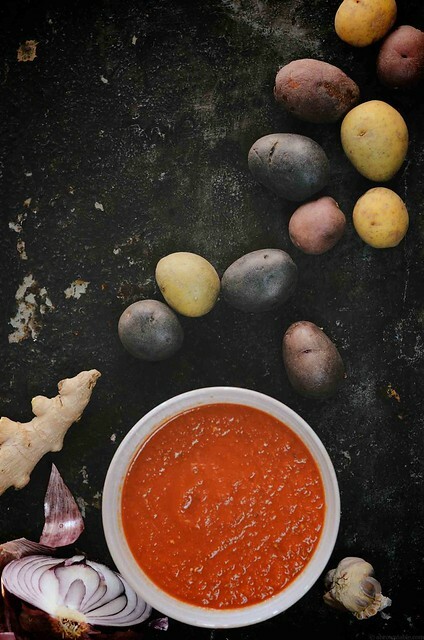 Fresh tomatoes and aromatics make the base of this delicious sauce that is flavored with a delicious mixture of spices. 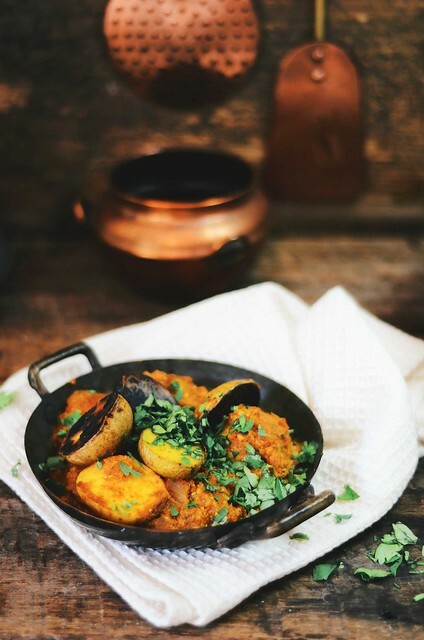 Serve this dum aloo fresh and hot with a side of India flatbread such as roti or naan or even plain rice and a side of chilled plain yogurt and a salad. 1. Rinse the potatoes under cold tap water, wipe them dry and slice the potatoes in half across their length. Prick the potatoes twice with the prongs of a fork. Heat a cast-iron or non-stick skillet with a lid on a medium-low flame. Add 1 tablespoon of the ghee/oil and heat for 30 seconds. 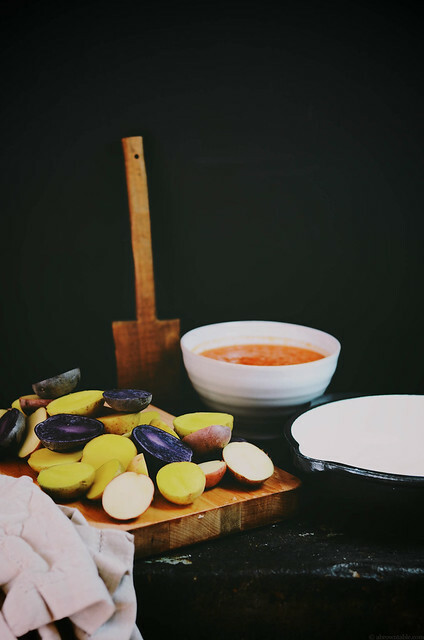 Once the oil is hot, add the potatoes, cover the saucepan with a lid and cook them on each side until they are lightly browned and get light brown blisters on each side. This should take about 6-8 minutes. Remove the potatoes and sprinkle them with 1/2 teaspoon of the salt. The potatoes should be almost tender but not completely cooked. 3. Heat the rest of the oil in a wok or saucepan with a lid on medium-high. Add the pureed tomato spice mixture from step 2. Cook this sauce for about 3-4 minutes with occasional stirring. Reduce the flame immediately to a gentle simmer, add the rest of the salt and fold in the potatoes. Cover with the wok with its lid and allow to cook untii the potatoes are completely tender but not mushy. This should take about 15 minutes. Once the potatoes are cooked, fold in the yogurt. Cook with constant stirring (to prevent burning) for about 2 minutes and remove from stove. The sauce should be thick in consistency. Taste the sauce to make sure the amount of salt is enough. Garnish with freshly chopped cilantro leaves and serve hot with rice, roti or naan.